Baldwin Hills is a neighborhood within the South Los Angeles region of Los Angeles California. It is home to Kenneth Hahn State Regional Park and to Village Green, a National Historic Landmark. 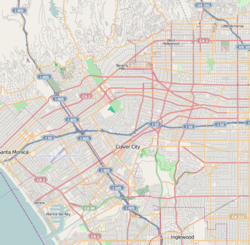 Baldwin Hills is bounded by La Cienega Boulevard to the west, Crenshaw Boulevard to the east, Stocker Street to the south and Rodeo Road to the north with Martin Luther King Jr. Boulevard forming the northeast dividing line between Baldwin Hills and Crenshaw Manor. It is bordered on the west by Culver City and it shares the eastern border of Crenshaw Boulevard with Leimert Park. The namesake mountain range is part of the neighborhood. Baldwin Hills and other surrounding geography are named for the famous 19th century horse racing and land development pioneer, Elias J. "Lucky" Baldwin. Ran historic early 19th century eastern hills Rancho land grant. Sanchez Adobe de Rancho La Cienega o Paso de la Tijera. The adobe was once the center of the rancho. In the 1920s, an addition was built linking the structures and the building was converted into a larger clubhouse for the Sunset Golf Course. Rancho Rincon de los Bueyes: original early 19th century western section Rancho land grant. The 1932 Los Angeles Olympics housed athletes at the Olympic Village in Baldwin Hills. It was the site of the very first Olympic Village ever built, for the 1932 Los Angeles Summer Olympic Games. Built for male athletes only, the village consisted of several hundred buildings, including post and telegraph offices, an amphitheater, a hospital, a fire department, and a bank. Female athletes were housed at the Chapman Park Hotel on Wilshire Boulevard. The Olympic Village was demolished after the Summer Olympic Games. On December 14, 1963, a crack appeared in the Baldwin Hills Dam impounding the Baldwin Hills Reservoir. Within a few hours, water rushing through the crack eroded the earthen dam, gradually widening the crack until the dam failed catastrophically at 3:38 pm. Although the area had been evacuated after the crack had been discovered, several homes were destroyed, and most of Baldwin Vista and the historic Village Green community were flooded. The dam's failure was ultimately determined to be the result of subsidence, caused by overexploitation of the Inglewood Oil Field. The dam's failure prompted the Los Angeles Department of Water and Power to close and drain other small local reservoirs with similar designs, such as the Silver Lake Reservoir. The Baldwin Hills Dam was not rebuilt—instead, the empty reservoir was demolished, filled with earth, landscaped, and converted to Kenneth Hahn Regional Park. During the summer of 1985, a brush fire along La Brea Avenue spread up the canyon towards the homes along Don Carlos Drive in Baldwin Hills Estates. Many homes were destroyed despite the efforts of the Los Angeles Fire Department to suppress the flames. The fire killed three people and destroyed 69 homes; the arsonist was never caught. View from Baldwin Hills of Downtown Los Angeles in the distance and the San Gabriel Mountains. Baldwin Hills Estates is locally known as "The Dons", because all but one street begins with the formal title of Los Angeles' original land holders. The oldest two streets in the Dons are Don Luis Drive and Don Mariano Drive. Old maps show those streets with the names Sprague and Maryann. Susan B. Miller High School has called its student body The Dorsey Dons and Donnas after this neighborhood. The neighborhood is east of La Brea, southwest of Santo Tomas Drive, south of the Jim Gilliam Recreation Center and north of Stocker Street). It is sometimes called "the Black Beverly Hills". The neighborhood is characterized by hillside houses with swimming pools, and modern condominiums (the latter often jut out from steep hillsides, perched on stilts). Baldwin Vista is north of Coliseum Street and west of the major thoroughfare, La Brea Avenue, with slightly smaller homes and a more secluded ambience. Village Green, originally named Baldwin Hills Village and within Baldwin Vista, is a historic Mid-Century modern "garden city" developed by Walter H. Leimert (1877–1970) multi-family residential. It was designated as a National Historic Landmark in 2001. The units are now condominiums on very spacious grounds, attracting seniors, young families, and design professionals as residents. Baldwin Village: since 1990 the city has promoted use of the official name "Baldwin Village". The southernmost portion of Baldwin Hills is outside the Los Angeles City limits. Along with View Park-Windsor Hills and Ladera Heights, it resides in an unincorporated area of Los Angeles County. Stocker Street divides Baldwin Hills from the View Park neighborhood. The northeast face of the hills overlooks the Baldwin Hills Crenshaw Plaza shopping mall and Marlton Square's Kaiser Permanente medical office building. Baldwin Hills Scenic Overlook is located at 6300 Hetzler Road in Culver City, CA. The 8.5-acre (3.4 ha) park is open daily from 8 a.m. to sunset. The Visitor Center is open Thursday–Sunday from 10 a.m. to 5 p.m. The park includes an amphitheater, drinking water, the Evan Frankel Discovery Center, gardening boxes, picnic tables, a permeable parking lot ($6), toilets, and walking paths with a central feature known as the Culver City Stairs. The Visitor Center has a comprehensive guide to the native plants of the area and history of Culver City. On a clear day the Overlook's platform offers exceptional views spanning the Pacific Ocean to the west, the Hollywood Sign to the north, and downtown Los Angeles to the east. Kenneth Hahn State Regional Park is located at 4100 South La Cienega Boulevard. It is a 401 acre recreation and sports area. Norman O Houston Park: is located at 4800 South La Brea Avenue. The Los Angeles Public Library operates the Baldwin Hills Branch Library. It is located at 2900 La Brea Avenue. From 2007 to 2009, BET aired Baldwin Hills, a program featuring several African-American teenagers and their lives in the upper-class Los Angeles community. The show is very similar in nature to such MTV programs as Laguna Beach: The Real Orange County, The Hills, and the online series The Suburbs, as it features African-Americans of upper-middle-class families who divide their time between attending school, playing sports, shopping at high-end stores, and driving expensive cars. The series lasted for three seasons. Orson Scott Card's urban fantasy novel Magic Street is set in Baldwin Hills. ^ a b "Rancho La Cienega O'Paso de La Tijera". Laokay.com. Retrieved August 22, 2010. ^ "14 Secrets of the 1932 Olympic Village in Baldwin Hills". ^ "1932 Los Angeles Olympic Athlete's Village in the Baldwin Hills". Baldwinhillspark.info. Retrieved November 12, 2007. ^ a b c Pollard-Terry, Gayle (October 29, 2006). "Years later, the pitch still delivers". Neighborly Advice. Los Angeles Times. p. K2. ^ Hale, Mike (2007-08-07). "Posh Princes and Princesses of the Hills". The New York Times. Retrieved 2008-08-13. ^ Erika Hayasaki, "Gang Violence Fuels Racial Tensions," Los Angeles Times, September 30, 2006, page B-1. Link requires the use of a library card. ^ "Baldwin Hills Crenshaw Medical Offices". thrive.kaiserpermsnente.org. Retrieved 2017-06-13. ^ "trail map" (PDF). Retrieved 2012-09-13. ^ "Baldwin Hills Recreation Center Archived 2010-02-28 at the Wayback Machine". City of Los Angeles. Retrieved on March 23, 2010. ^ "Kenneth Hahn State Park". Parks.ca.gov. Retrieved August 22, 2010. ^ "Norman O Houston Park website". Laparks.org. Retrieved 2012-09-13. ^ "Jim Gilliam Recreation Center website". Laparks.org. Retrieved 2012-09-13. ^ "Baldwin Hills Branch Library". Los Angeles Public Library. Retrieved on March 23, 2010. ^ "Baldwin Hills Elementary School". Lausd.k12.ca.us. Archived from the original on 2009-05-05. Retrieved 2012-09-13. ^ "Baldwin Hills". BET. Archived from the original on August 4, 2007. Retrieved January 9, 2015. ^ "Can "Baldwin Hills" become the black "Laguna Beach"?". ^ "Fiction Book Review: Magic Street by Orson Scott Card, Author . Del Rey $24.95 (397p) ISBN 978-0-345-41689-6". ^ "Elfman in L.A." Elfman.filmmusic.com. Archived from the original on 2011-10-01. Wikimedia Commons has media related to Baldwin Hills, Los Angeles. University Park Family—a collaborative online community: focused on University Park, Expo Park and the surrounding areas. Leimert Park Beat—a collaborative online community focused on Leimert Park: "The Soul of Los Angeles and the African American cultural center of the city."